When I watched former U.S. President Jimmy Carter's TEDWomen talk on a livestream this year, I knew it was headed for the blog. Frequent readers know that I've only published a man's speech one other time in our Famous Speech Friday series. This is a very serious problem. It's ordinarily not addressed. A number of years ago, in the year 2000, I had been a Baptist, a Southern Baptist for 70 years -- I tell you, I still teach Sunday school every Sunday; I'll be teaching this Sunday as well -- but the Southern Baptist Convention in the year 2000 decided that women should play a secondary position, a subservient position to men. So they issued an edict, in effect, that prevents women from being priests, pastors, deacons in the church, or chaplains in the military, and if a woman teaches a classroom in a Southern Baptist seminary, they cannot teach if a boy is in the room, because you can find verses in the Bible, there's over 30,000 verses in the Bible, that say that a woman shouldn't teach a man, and so forth. But the basic thing is the scriptures are misinterpreted to keep men in an ascendant position. That is an all-pervasive problem, because men can exert that power and if an abusive husband or an employer, for instance, wants to cheat women, they can say that if women are not equal in the eyes of God, why should I treat them as equals myself? Why should I pay them equal pay for doing the same kind of work? There are many more gems and tough issues in this talk. My favorite was one cause he listed for why abuse of women and girls takes place: "Men don't give a damn." He talked about men who say they support women and girls, but quietly accept the white male privilege that they are able to possess, comparing it to the "separate but equal" approach to racial segregation. What can you learn from this speech? This is what a male ally looks like: I admire Carter for using his position--not just as a former president and activist in human rights around the world, but as a privileged white man of faith--for calling out the discrepancies he sees, and naming them as abusive. Every day on Twitter, I see women noting these behaviors, specifically in religious settings. Their voices are not heard widely, but here, he is speaking for them. Dates matter: It's easy and familiar and fashionable to dismiss this type of behavior as in the past. But Carter uses dates to add specificity and show that discriminating against women using religion as an excuse is both an ancient and a modern practice. 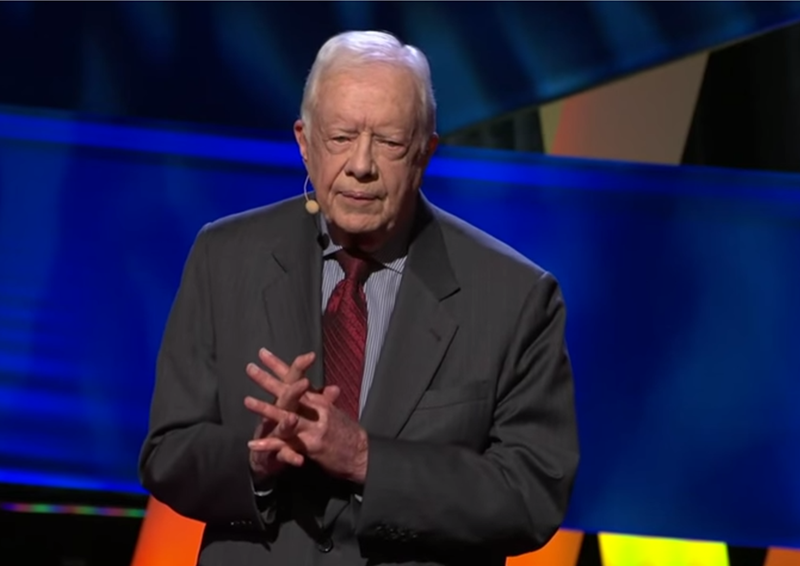 Formula: Humility, honesty, heart: Carter blends so well in this talk qualities of humility, honesty, and heart. I see on Twitter, often, women who note that men turn down invitations to speak at women's conferences, yet here is a man who came willingly to TEDWomen and spoke with all those qualities. Watch and learn. There's courage and vulnerability here a-plenty.